With this lockout looking like it will drag on for some time and no NHL action in sight, we've been receiving a lot of questions from our readers and friends. We did our best to try and answer some of the burning questions surrounding the Lockout and hope they help you through these tough times of no NHL hockey. How many goals will Jordan Eberle score in the American Hockey League if the Lockout cancels the NHL season? If he plays a full season he should score 50+ and hit a similar point total to that of Jason Spezza's 117 during the 04-05 Lockout. Eberle will be playing with some familiar faces in Oklahoma City including Ryan Nugent-Hopkins and should be able to dominate the league offensively, although he will miss his roommate and thunderbuddy, Taylor Hall. How many girls will Rick Nash and Joe Thornton tag team in Switzerland? We think three-a-week is pretty reasonable for the HC Davos duo, or at least one for every Rick Nash goal that Jumbo Joe assists on. How would you end the NHL Lockout? We would put all the NHL owners and Gary Bettman in a locked room with unmade Ikea furniture and tell them we'd only let them out if they could assemble everything in the room. After a few days, the NHL owners would break down and give in to any CBA offer from the NHLPA just as long as they could get the hell out of the room and never see another piece of Ikea furniture again. How many suspensions will Alexander Ovechkin receive if he plays a full season in the KHL? None. If he leaves his feet on a hit he will be awarded a penalty shot. During the 1994 Lockout, Chris Chelios made some comments about Gary Bettman's safety. What current NHLer do you think would make similar comments now? Chris Chelios. Oh wait, he retired last year. There's a couple guys that seem like loose cannons, but we'd have to go with Paul Bissonnette "accidentally" Tweeting something at 2am while in Las Vegas. Will there be any NHLers in Europe who don't come back when the Lockout ends? We know Ovi threatened it, but he'll be back. Lubomir Visnovsky might never come back by continuing to claim his trade to the Islanders was invalid. Jason Spezza and his weird laugh might fit in over there so he might stay behind. Nail Yakupov might be held hostage by the KHL and be forced to play there for the rest of his life. There may be a few that could be convinced to bail on their NHL contracts for a European lifestyle, but in the end, the NHL is the biggest stage and where they've dreamed of playing so they'll be back. I have a joke for you guys. The Toronto Maple Leafs. First off, that's not a question, and second, we heard that one years ago. 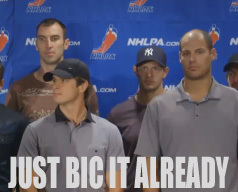 After this lockout, how much hair will Ryan Getzlaf have left? He will have about as much hair as Phil Kessel has personality…not much. What will Sidney Crosby to do during this Lockout? What he does with most of his free time - look at Paulina Gretzky's Instagram photos. In a drinking contest who would win? Theo Fleury or Patrick Kane? 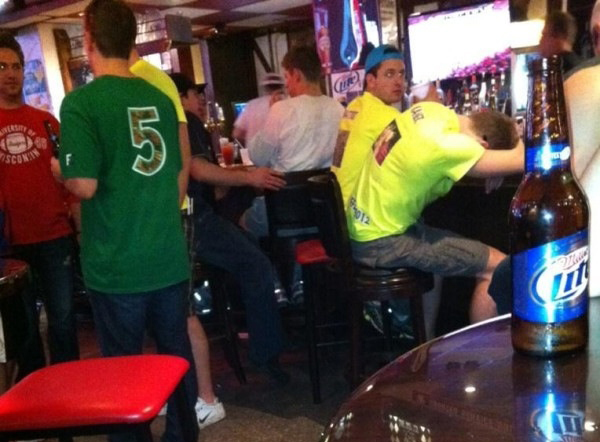 There's no photo of Theo passed out in any stripclubs so we'll have to give it to him. Do you guys actually make any money from your stupid site? The good news is we don't lose any money from this stupid site. What are the chances of Sean Avery crashing Dion Phaneuf's wedding? 11% chance, which oddly enough is the percentage of Phaneuf shots that actually hit the net. I give Theo the edge over Patty Kane in the booze department. I've got a question for you. Is Daryl Katz real or a cartoon villain? Cyryl Sneer? We don't think Rob Schneider has been a villain in anything so you're probably dead on with Sneer. Is Katz's bigheaded son, Snag?